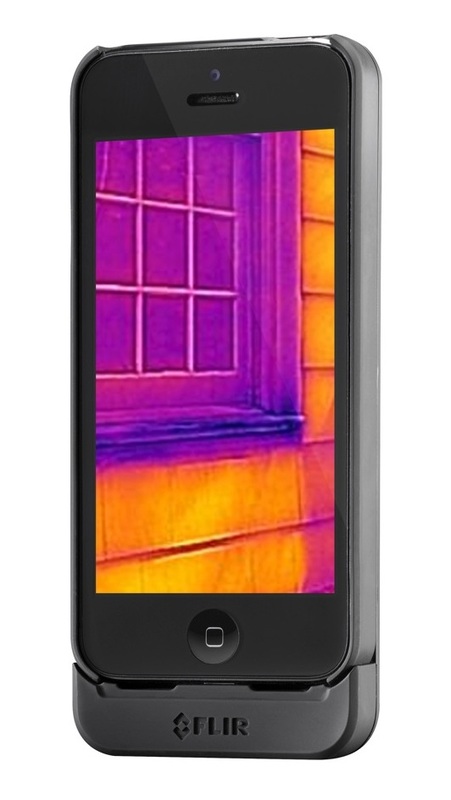 Update: See our review of the newest FLIR ONE Infrared Camera for iOS and Android. 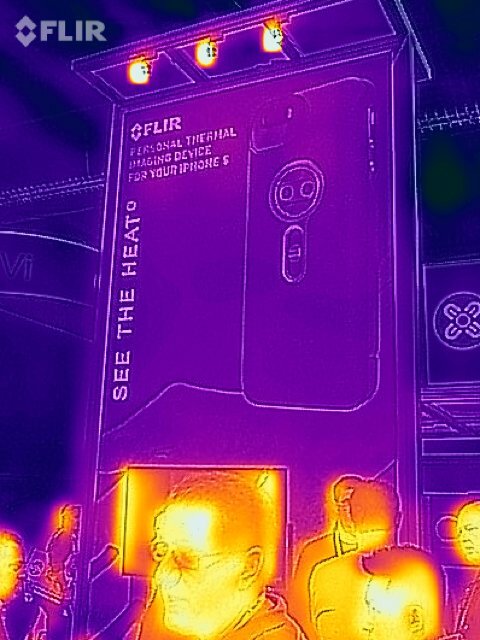 The new FLIR ONE iPhone Infrared Camera launched to swarming crowds this week at the Consumer Electronics Show in Las Vegas. 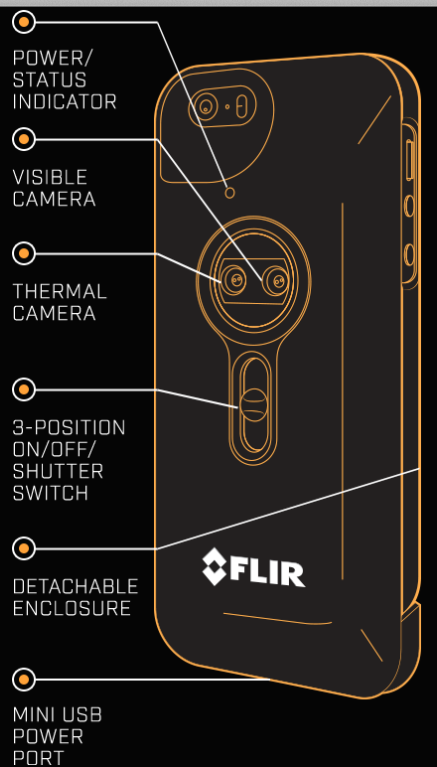 The FLIR ONE is an accessory case for the iPhone 5 and 5S that snaps onto the back of the phone, adding a fully integrated thermal imaging camera. Thermal images and videos can be captured to the phone and shared seamlessly through Facebook, Twitter, text message, and all the other ways you would expect from an iPhone. Priced at $349 and available this spring, it is undoubtedly the best iPhone accessory at the CES show this year. And in a sea of accessories, that’s saying something. Born out of the FLIR mantra of “Infrared Everywhere,” the FLIR ONE also bears its own apt motto, “See the Heat.” The thermal camera of the FLIR ONE can visualize the temperature patterns of almost everything on the earth, from 32 to 212 °F (0 to 100 °C). Consider the possibilities–iPhone users everywhere can now view the world around them in a completely different band of the electromagnetic spectrum. As millions of users gain access to the technology in coming months and years, it seems likely that current infrared applications will be eclipsed by yet unknown uses. Of course it also seems inevitable that YouTube will be overrun with infrared videos of cats. 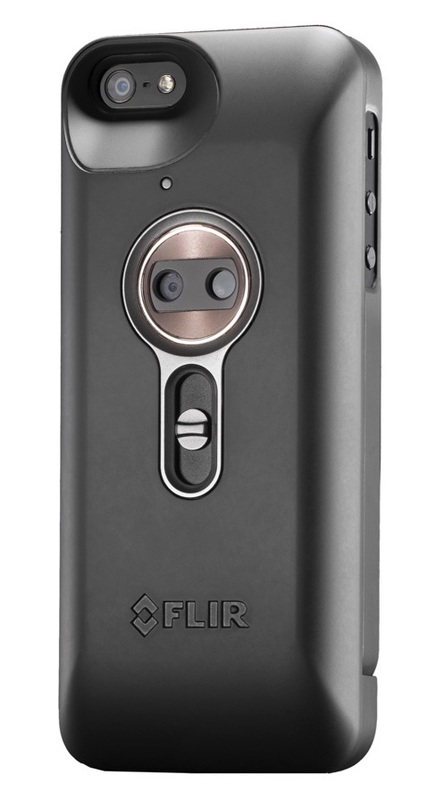 The FLIR ONE iPhone Infrared Camera is composed of two interlocking cases. A thin wraparound case stays on the iPhone, appearing and performing as would any minimalist iPhone case. Yet this basic surround also facilitates a secure and quick connection the the main thermal imaging unit. The two cases together add a negligible 3.2 ounces to the iPhone. Those currently using larger iPhone cases will notice little difference. The FLIR ONE roughly doubles the thickness of the current phone, making it just a bit thicker than the first generation iPhone. Resolution for the FLIR ONE is 80 x 60, for a total of 4800 pixels. While not overwhelming when all the talk is about 4K televisions, users of infrared are predominantly looking for thermal patterns, not capturing the family vacation at Disney. (Prediction: Infrared mouse videos on YouTube.) FLIR has also applied some great technology to help users get the most out of the resolution. Multi-Spectral Dynamic Imaging, or MSX, makes use of the second camera visible on the FLIR ONE, a visible light camera with a resolution of 640 x 480. MSX uses the visible light image to mine data about surface patterns and edges, then embosses this information into the thermal image. The effect is that the somewhat low thermal resolution is much more intelligible to the eye, giving the impression of a much higher resolution. MSX image showing both thermal and visible light detail. For the first time on any of their portable thermal cameras, FLIR has also incorporated image enhancement technology. When capturing a still image the FLIR ONE will actually take a series of images. Because of the slight movement of the body these images are capturing thermal data from slightly different positions, meaning the thermal detector has actually captured more than just 80 x 60 pixels. The FLIR ONE will instantly stitch these images together into one combined image with a resolution of 160 x 120, or four times the stated resolution. Now you have a 19,200 pixel iPhone IR camera. 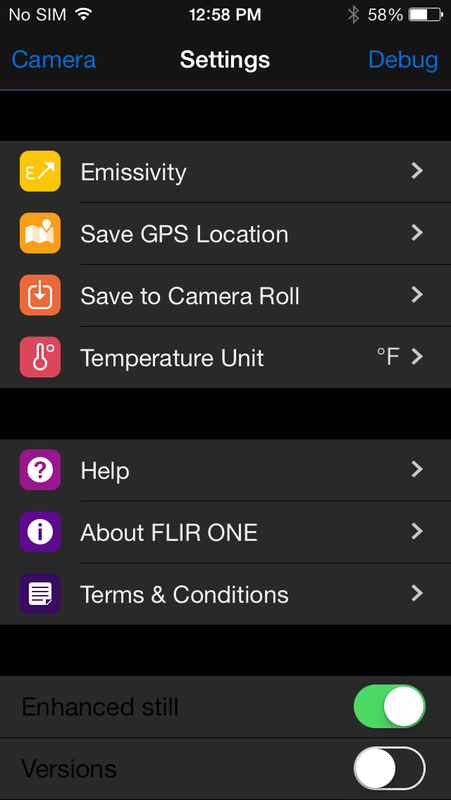 The FLIR ONE operates using a free application available in the App Store called FLIR ONE MX. Current specifications call for iOS 7 or above. FLIR ONE MX is capable of viewing a live stream at 9hz, and can capture thermal still images (.jpg) and thermal video (.mov). The stored media can be shared via Facebook, Instagram, Twitter, and more, as well as sent by email and sms text message. For even more options and convenience, images can be saved to the iPhone camera roll. Additionally, FLIR will be offering a software developers kit (SDK) that will catalyze innovative incorporation of the thermal camera into many other available apps. Screenshot of the menu from the FLIR ONE. The user interface of the FLIR ONE MX app is befitting the iPhone, and the controls are simple and intuitive. Color palettes are changed simply by swiping left or right, and image capture and review is located at the bottom of the screen, similar to the iPhone camera interface. The settings menu is a welcome single level deep, with simple sliding switches to toggle features on and off. One notable item on the settings menu is the option to store GPS data with the thermal image. While previously available on some of FLIR’s professional thermal cameras, this is a excellent inclusion on the FLIR ONE, and a feature that many iPhone users have come to expect. The menu also allows the user to turn off the center crosshair that measures temperature, a convenient option for capturing unobstructed images when temperature measurement is unnecessary. The FLIR ONE iPhone Infrared Camera is built around FLIR’s new Lepton thermal core. Sized at around 3/8” cubed, the Lepton incorporates the 80 x 60 thermal detector and associated processing. Users familiar with thermal cameras will notice that the FLIR ONE does not perform the occasional “clicking” correction function found on most imagers. This correction is necessary to ensure that the image is accurately portrayed, and is essential to good temperature measurement. Instead of an automatic function, the FLIR ONE signals the user to perform the correction by applying a symbol on the screen. You slide the switch on the back of the case downward, and the camera will manually perform the correction. This user initiated correction function saves on the packaging size for the Lepton core, and ultimately the overall size of the FLIR ONE. The FLIR ONE unit incorporates a battery pack capable of powering for the infrared camera for roughly two hours of continuous use. Conveniently, the battery can also be used as a booster for the iPhone by toggling a function in the FLIR ONE MX app. The FLIR ONE includes the two cases, USB cable, and a leatherette carrying case. For a look at the FLIR ONE in action, see the thermal video we recorded at CES. What’s the detection distance for people out in the open field? Dean – FLIR has not yet released the full specifications of the camera, so it’s a little hard to say what you could see at what distance. One big piece of data we would need is the lens fitted to the FLIR ONE. Since the Lepton core is brand new, I can’t even speculate as to what the available lenses might be. But like you, I’m very curious. We will just have to wait and see…. How much longer before Apple changes the dimensions on their next model iphone…then what becomes of my FLIR? Would like to try this for hunting feral hogs at night. It seems to offer all the features I want for about 1/10 of what I was planning on spending. Plus a ton of cool software tools as a bonus. Sweet! Good question. NEED for Android though. Have you looked at Therm-App? To the best of my knowledge, it’s the only Android thermal camera in the market. COOL TOOL… GOTTA HAVE ONE… NOW! Any conclusive word on the availability of the iPhone Flir 1 ? Received mine yesterday. Works as advertised but I have not used it much yet. Got mine today and having a ball looking at all the frames and wall and floor Joyce in the house. Very easy to use. i need to get both pictures from the flir one the thermal one wich is not a big problem to get but also i need the non thermal one i cannot find the non thermal on the phone, but i can see it inside the flir software.